Secret of the Mahabharata. Parimal Prakashan, Aurangabad. 1984. 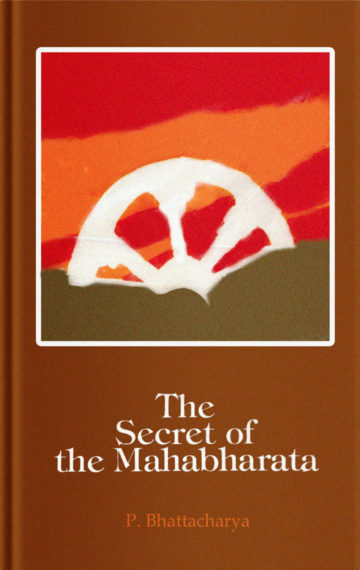 The Secret of the Mahabharata is the fruit of a decade of intensive study of the epic of the Bharatas. The author seeks to investigate whether the composers of this epic were simple tellers-of-tales, or something more. He argues that they were seer poets who were seeking to put across to a polity devastated by a cataclysmic conflict the spiritual secrets of a bygone Vedic era. In this quest the wandering suta became a ready vehicle as he went from place to place carrying these skilfully wrought myths to the people. Churning of the Ocean: “Pradip Bhattacharya is not only an able administrator…but an erudite scholar. In the present work, he has delved into some of the most revolting (apparently) episodes of the Mahabharata, and tried to explain their deep moral/spiritual significance…No doubt, all this is interesting and thought-provoking and probably hints at the true import of the myth in the Mahabharata.” Dr. H. D. Sankalia, The Times of India. Message in the Myth: “Pradip Bhattacharya’s work is an erudite and important study of Vedic spiritual messages and symbols as transmitted and popularised through the Mahabharata myths & stories…The analysis is essentially dialectical in mode and principle…The logic involved is not formal-rational but dialectical-esoteric. An excellent work.” Prof. Subir Das Gupta, The Telegraph. Vyasa & the Vedic Secret: “A brilliant analysis of Vyasa’s myths in terms of Vedic truths comes as a fresh corroboration of the validity of the integral approach… It is delightful to see the author reads correctly the message of Vyasa…with a marvellous sweep from Veda to Savitri…Shri Bhattacharya’s scholarship has an eye and ear for the mystic, which is the essential pre-requisite for a researcher in Indology… After going through the 155 pages of his book, one is convinced that the Mahabharata is a unique time-capsule invented by Vyasa the Veda–the Grand Synthesis–is preserved for posterity.” Dr. Gauri Dharmapal, The Statesman, Mother India and Srinvantu. “The technique the author adopts to discover the secret meaning is indeed a Herculean task. Since the Mantras reveal their innermost secret only to an intuitive mind, Bhattacharya with little difficulty attains success…the fruit of a decade of intensive study of the epic…(his) arguments are very convincing and his discoveries open up new vistas in the Hindu epic lore. Certainly the seeker after spiritual truth cannot afford to ignore this book which is a consummate scholarly piece of work written with verve and style.” Dr. P. Raja, Mother India. The Impact Eternal–Lights From the Great Epic: “An equally noteworthy addition to the Mahabharata lore by a senior member of the Indian Administrative Service who is basically a serious scholar…The author chooses some of the episodes in the epic and discovers the truths underlying the story elements. He performs his complex task ably, mostly with the help of Sri Aurobindo’s Vedic Glossary compiled by A. B. Purani.” Prof. Manoj Das, The Heritage. “I read your book on the Mahabharata and enjoyed it greatly. More than anything, it showed a deep and moving comprehension of the symbols, something experienced rather than simply quoted…after reading your book I feel like doing a story of the ‘Earings’…Thank you for the experience your book afforded me.” Maggi Lidchi Grassi, internationally renowned novelist. “I am impressed by your perceptive scholarship and find your analysis of the subject interesting. I agree with many of your conclusions.” M.P. Pandit, Sri Aurobindo Ashram, Pondicherry.